Victor Gruen created the concept of the regional shopping mall, which had a strong influence on urban landscapes worldwide. In addition to his commercial success, he was a very active lecturer and author discussing the future of cities in Europe and the United States. Victor Gruen was born in Vienna, Austria, in 1903, where he also trained to be an architect at the Academy of Fine Arts. After leaving the Academy he worked as a draftsman and supervisor on local construction sites for several years. In 1933, he opened his first architectural office engaging primarily in commercial architecture. The decidedly modern layout of the stores designed by Gruen during the 1930s earned him a positive recognition in professional circles. Gruen was forced to leave Austria shortly after the Nazis annexed the country in 1938 due to his religious and political background as a Jew and a social democrat. He escaped from Europe and made his way to the United States. Initially, he settled in New York where he formed a successful partnership with Elsie Krummeck. and was involved with designs for the World's Fair. The architectural firm Gruen & Krummeck followed up on the work Gruen had done in Austria by keeping the focus on store design. As a side project, Gruen, together with other émigrés, organized the “Viennese Theater Group,” which produced two Broadway shows. In order to complete several large projects for a department store chain on the West Coast, Gruen & Krummeck relocated to Los Angeles in the early 1940s. Gruen’s major commercial success and publicity are related to the construction of fully enclosed regional shopping malls. The first of a number of influential projects in this sector, the Northland Center in the proximity of Detroit, MI, opened its doors in 1954. In the meantime, Gruen had parted ways with Krummeck and founded a new office. Victor Gruen Associates, still in business today, started operation in 1949 and soon became one of the most successful architectural firms in the US with a staff of over 300 employees. Gruen’s founding senior partner was Rudolf Baumfeld, another émigré architect from Vienna, with whom Gruen had already been working before 1938. Gruen’s office implemented several regional mall projects in the 1950s and 1960s, but at the same time the team increasingly became involved with planning work focused on central business districts. This expansion of activities was accompanied by a broadening international scope that lead to the creation of Victor Gruen International in 1967. The following year, Gruen retired from his architectural practice and moved back to Vienna. He had been visiting Europe and especially his birthplace regularly since 1948. Back in Europe, Gruen worked as a consultant on several large public and commercial projects. The “Victor Gruen Foundation for Environmental Planning,” which had offices in Los Angeles and Vienna, became another focal point of Gruen’s work during this last stage of his career. Throughout his career, Gruen, aside from heading international construction and planning projects, published several articles and books, lectured at a number of universities and was a sought-after public speaker. He analyzed and tried to find solutions for the problems of modern urbanity, namely congestion and pollution caused by excessive automobile traffic and unplanned decentralization. Gruen, Victor. The Heart of Our Cities. The Urban Crisis: Diagnosis and Cure. New York: Simon and Schuster, 1964. Gruen, Victor. Shopping Towns USA: The Planning of Shopping Centres. New York: Reinhold, 1960. Hardwick, Jeffrey M. Mall Maker. 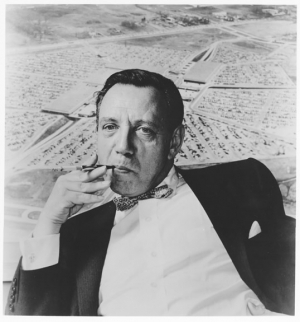 Victor Gruen, Architect of an American Dream. Philadelphia: University of Pennsylvania Press, 2004. Wall, Alex. Victor Gruen. From Urban Shop to New City. Barcelona: Actar, 2005. Victor Gruen Papers, American Heritage Center, University of Wyoming, Laramie, WY . Victor Gruen Papers, Manuscript Division, Library of Congress, Washington, DC.